About one year ago, Scott Hodge authored a report explaining the mechanics and utility of the Tax Foundation’s Taxes and Growth Dynamic Model. He made a very persuasive argument about the need to modernize and improve the Joint Committee on Taxation’s antiquated revenue-estimating process by estimating the degree to which changes in tax policy impact economic performance. The use of “dynamic scoring,” Scott explained, would produce more accurate data than “static scoring,” which is based on rather bizarre and untenable assumption that the economy’s output is unaffected by taxation. Conventional scoring treats this process as an exercise in arithmetic, whereas dynamic scoring makes the process an exercise in economics. Since I’m a proponent of the Laffer Curve, I obviously applaud the Tax Foundation’s superb work on this issue. And for those who doubt the value of dynamic scoring, I challenge them to come up with an alternative explanation for why rich people paid five times as much tax after Reagan lowered the top tax rate from 70 percent to 28 percent in the 1980s. But the Laffer Curve isn’t the focus of today’s column. Instead, I want to address the argument that supply-side tax policy (i.e., lower marginal tax rates, less tax bias against saving and investment) is no longer important or desirable. Writing for Slate, Reihan Salam argues that Donald Trump’s success is a sign that the traditional tax-cutting agenda no longer is relevant. Why can’t his GOP opponents convince Republican voters that they would do a far better job than Trump of defending middle-class economic interests? …Trump has demonstrated its weakness and the failure of its stale policy agenda to resonate with voters. …The GOP can no longer survive as the party of tax cuts for the rich. …If Republicans are to win the trust of working- and middle-class voters who’ve grown deeply skeptical of their economic nostrums, they will have to do something dramatic: It’s time for the GOP to abandon its near-obsessive devotion to tax cuts that disproportionately benefit upper-income households. …The GOP elite has also yet to grasp that most voters simply don’t care as much about taxes as they did in the Reagan era. …the share of voters who consider their federal tax burden their top priority is a mere 1 percent. To break out of their tax trap, Republicans…should continue to back tax cuts for the middle class, and in particular for middle-class parents. But until the country sees large and sustained budget surpluses, there should be no tax cuts for households earning $250,000 or more. In the Tax Foundation study, Scott succinctly summarized the issue. The primary goal of comprehensive tax reform is economic growth. …It is critically important that lawmakers make the right choices that lift everyone’s standards of living. …It’s not that we lose any sleep about the average tax rate of successful people. We just don’t want to discourage highly productive investors, entrepreneurs, and small business owners from doing things that result in more growth and prosperity for the rest of us. But what are those “right choices” that “result in more growth and prosperity for the rest of us”? The Tax Foundation points us in the right direction. Let’s look at some charts (updated versions of the ones in Scott’s report), starting with this estimate of how various tax cuts affect overall economic output. 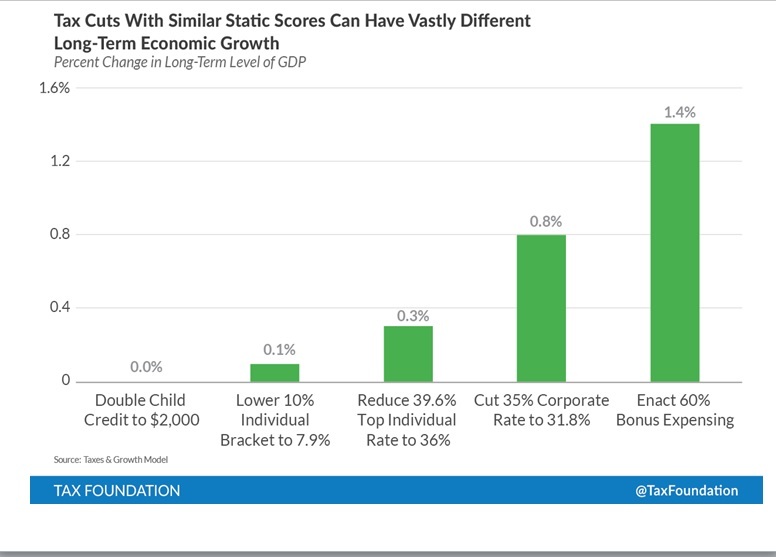 As you can see, expanded child credits don’t have any positive impact on growth for the simple reason that they don’t alter incentives to work, save, or invest (they may be desirable for other reasons, however). Lower marginal tax rates lead to some added growth, particularly if the top rate is reduced since upper-income taxpayers have far greater control of the timing, level, and composition of their income. 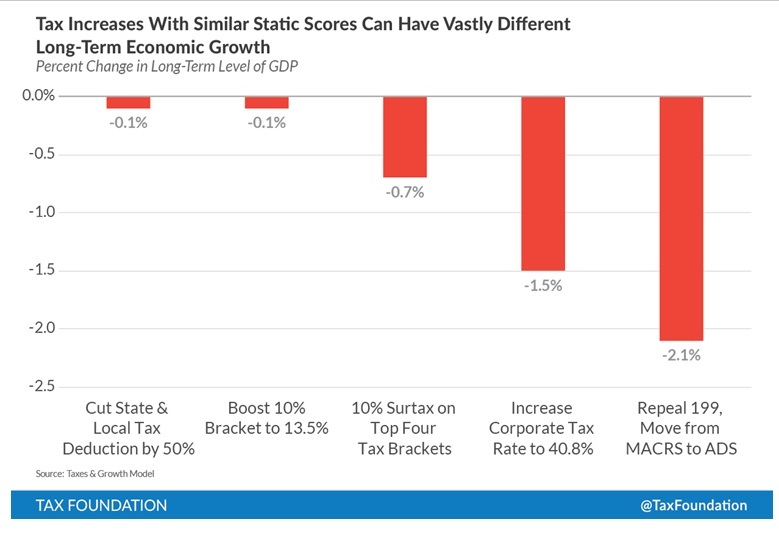 But the biggest growth effects come from lowering the corporate tax rate and reducing the tax code’s bias against new investment. Now let’s take the next step. If changes in tax policy lead to increases in economic output, that also means a greater amount of taxable income. So the Tax Foundation also can tell us the degree to which the aforementioned tax cuts will change revenue after 10 years. As you can see, most tax cuts result in less revenue, but in some cases there’s a considerable amount of revenue feedback. And if policy makers shift toward expensing, the long-run effect is more tax revenue. Now let’s look from the other perspective. What happens to the economy if various tax hikes are imposed? As you can see, some tax increases have relatively modest effects on economic output while others significantly discourage productive behavior. And when you feed the growth effects back into the model, you then can see the likely real-world effect of those tax increases on tax revenue. By the way, these charts show why the class-warfare tax policies of Hillary Clinton and Bernie Sanders are so misguided. The amount of economic damage per dollar collected would be ridiculous. Such tax increases wouldn’t be good for rich people, of course, but the real lesson is that the rest of us will be adversely affected because of a slower-growing economy. The bottom line is that poor people and middle-class people have much more opportunity and prosperity with a Hong Kong-style tax system instead of a punitive French-style tax system. To conclude, let’s now consider a few caveats. If you examine the broad measures of what causes prosperity, tax policy is just one piece of the puzzle. The burden of government spending also is important, as is trade policy, regulatory policy, monetary policy, property rights, and the rule of law. So it’s possible for a nation to be relatively prosperous with bad tax policy so long as it has free-market policies in other areas. It’s also possible for a nation with a good tax system to be poor and stagnant if other economic policies are statist and interventionist. But if the goal is faster growth and more broadly shared prosperity, why not seek good policy in all areas? The bottom line is that supply-side tax policies can contribute to better economic performance. In an ideal world, those policies also are politically popular. But even if they aren’t, the policy-making community should strive to educate the populace on what works, not abandon good policy for the sake of short-term political expediency. P.S. Even international bureaucracies acknowledge the Laffer Curve, which means they understand that changes in tax policy can lead to changes in taxable income. Such as this study from the OECD acknowledging that lower tax rates can lead to more taxable income. Or this study by the IMF, which not only acknowledges the Laffer Curve, but even suggests that the turbo-charged version exists. Or this European Central Bank study showing substantial Laffer-Curve effects. Or the United Nations admitting that the Laffer Curve limits the feasible amount of taxes that can be imposed. I’ve written several times about the importance of appointing sensible people to head the Congressional Budget Office (CBO) and Joint Committee on Taxation (JCT). Heck, making reforms to these Capitol Hill bureaucracies is a basic competency test for Republicans. That’s because CBO and JCT are the official scorekeepers when politicians consider changes in fiscal policy and it has a big (and bad) impact if they rely on outdated methods and bad analysis. The CBO, for instance, puts together economic analysis and baseline forecasts of revenue and spending, while also estimating what will happen if there are changes to spending programs. Seems like a straightforward task, but what if the bureaucrats assume that government spending “stimulates” the economy and they fail to measure the harmful impact of diverting resources from the productive sector of the economy to Washington? The JCT, by contrast, prepares estimates of what will happen to revenue if politicians make various changes in tax policy. Sounds like a simple task, but what if the bureaucrats make the ridiculous assumption that tax policy has no measurable impact on jobs, growth, or competitiveness, which leads to the preposterous conclusion that you maximize revenue with 100 percent tax rates? Writing for Investor’s Business Daily, former Treasury Department officials Ernie Christian and Gary Robbins explain why the controversy over these topics – sometimes referred to as “static scoring” vs “dynamic scoring” – is so important. It is Economics 101 that many federal taxes, regulations and spending programs create powerful incentives for people not to work, save, invest or otherwise efficiently perform the functions essential to their own well-being. These government-induced changes in behavior set off a chain reaction of macroeconomic effects that impair GDP growth, kill jobs, lower incomes and restrict upward mobility, especially among lower- and middle-income families. …Such measurements are de rigueur among credible academic and private-sector researchers who seek to determine the true size of the tax and regulatory burden on the economy and the true value of government spending, taking into account the economic damage it often causes. But not all supposed experts look at these second-order or indirect effects of government policy. And what’s amazing is that the official scorekeepers in Washington are the ones who refuse to recognize the real-world impact of changes in government policy. These indirect costs of government, in particular or in total, have not been calculated and disclosed in the Budget of the United States or in analyses by the Congressional Budget Office. The result of this deliberate omission by Washington has been to understate many costs of government, often by more than 100%, and grossly overstate its benefits. …It is on this foundation of disinformation that the highly disrespected, overly expensive and too often destructive federal government in Washington has been built. Christian and Robbins look specifically at the direct and indirect costs of the income tax. The income tax is a two-part tax, one acknowledged and one deliberately concealed. First, almost $2 trillion of income tax is collected by the IRS for government to spend for presumably beneficial purposes. Then there is the tax-induced economic damage, a stealth tax, indirectly picked from people’s pockets in the form of fewer jobs and lower incomes. This stealth tax is $3.2 trillion each year. …economists often refer to the stealth tax as a deadweight loss. …When the $2 trillion of income tax taken directly out of the economy by the IRS is added to the $3.2 trillion of indirect economic cost, the total private-sector cost of the income tax is $5.2 trillion — and the government has only $2 trillion of income tax revenues to spend in trying to repair the damage. By the way, I must disagree with the last part of this excerpt. Government doesn’t “repair the damage” of high taxes when it spends money. Most of the time, it exacerbates the damage of high taxes by spending money in ways that further weaken the economy. Let’s now get back to the part of the editorial that I like. Ernie and Gary make the very important point that some taxes do more damage than others. …when the IRS collects a dollar of income tax from corporations, the damage to the overall economy is about $4. Similarly, a dollar of tax on capital gains sets off a ripple effect that does about $6 of damage. Poison pills such as capitalizing (instead of expensing) the job-creating cost of machinery and equipment, taxing dividends, double-taxing personal saving and imposing high tax rates result in stealth taxes ranging from $3 to $8 per dollar of revenues. …Low tax rates do less damage to economic growth per dollar of revenues raised and are preferable to high tax rates, which have the opposite effect. Here’s a chart based on their analysis. I’m not overly fixated on their specific estimates. Even good economists, after all, have a hard time making accurate forecasts and correctly isolating the impact of discrete policies on overall economic performance. Moreover, it’s very difficult to factor in the economic impact of America’s tax-haven policies for foreign investors, which help offset the damage of high tax burdens on American citizens. But Christian and Robbins are completely correct about certain taxes doing more damage than other taxes. And the lesson they teach us is that the tax bias against saving and investment is extremely destructive. And the less fortunate are particularly disadvantaged when bad methodology at CBO and JCT perpetuates bad policy. …it is self-defeating and harmful to require that tax reforms always be revenue neutral in a near-term static sense. Imagine a tax reform that initially costs the IRS $1. Through economic growth, it promptly increases taxable income and well-offness by $2.50. At an average tax rate of 20%, the reform-induced $2.50 increase in taxable income at the outset recoups only 50 cents of the initial $1 cost to the IRS, thereby leaving the IRS 50 cents short in the near term. But who in the White House or Congress would refuse to make mostly lower and middle-income families $2.50 better off at a cost of only 50 cents to Washington’s already overflowing coffers? The final sentence of the excerpt hits the nail on the head. I’ve previously cited academic research and expert analysis to show that it is pointlessly punitive to raise tax rates if the damage to the private sector is several times greater than the additional revenue collected by government. And if you like videos, I have a three-part series on the Laffer Curve which is part of this post offering a lesson from the 1980s for Barack Obama. The bottom line is that we’ll continue to get bad analysis and bad numbers if Republicans aren’t smart enough to clean house at CBO and JCT. Since I’m a big advocate of the Laffer Curve, that means I favor dynamic scoring. This is the common-sense observation that you can’t figure out the effect of tax changes on revenue without first estimating the impact on taxable income. And I’ve shared some very persuasive data and analysis in favor of the Laffer Curve and dynamic scoring. The huge increase in taxes paid by upper-income taxpayers after Reagan slashed the top income tax rate. The fact that the overwhelming majority of CPAs believe in significant feedback effects. Even left-wing economists admit that you lose revenue if tax rates get too high. 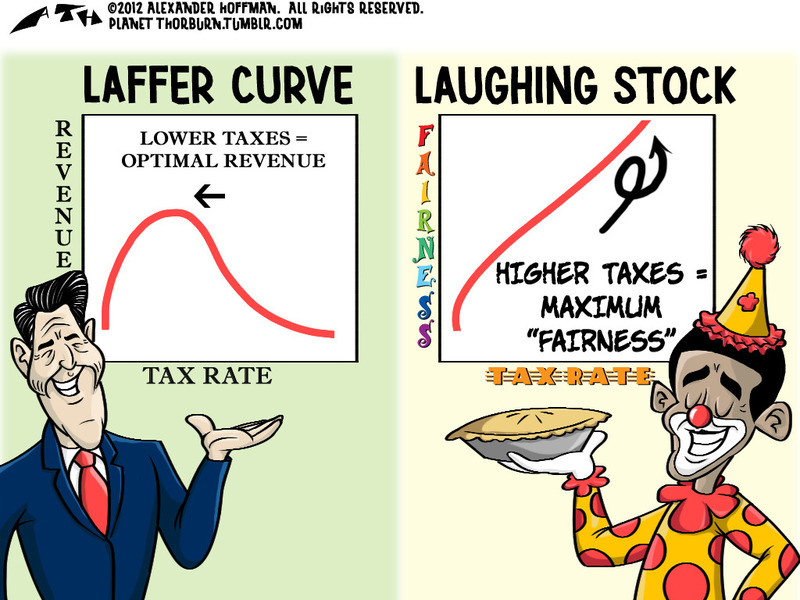 International bureaucracies even admit that there are “Laffer Curve” limits that make some tax hikes self-defeating. Notwithstanding all this evidence, we have a system in Washington that is based on static scoring, which simplistically assumes a linear relationship between tax rates and tax revenue. The Joint Committee on Taxation makes the revenue estimates, and reformers argue the status quo is biased in favor of higher tax and have long urged the system to be modernized to get more accurate numbers. Needless to say, establishment leftists don’t want to see any changes. Edward Kleinbard, a former Staff Director for the Joint Committee on Taxation, writes with disapproval in the New York Times that Republicans want to change the existing methodology for estimating the revenue impact of changes in tax policy. …at the top of their to-do list is changing how the government measures the impact of tax cuts on federal revenue: namely, to switch from so-called static scoring to “dynamic” scoring. While seemingly arcane, the change could have significant…consequences. Here’s his description of the issue, which is reasonably fair. …conventional estimates do not…incorporate macroeconomic behavioral changes. Dynamic scoring does. Proponents point out, correctly, that if a tax proposal is large enough, then those sorts of feedback effects can aim the entire economy on a slightly different path. Such proponents argue that conventional projections are skewed against tax cuts, because they do not consider that cutting taxes could lead to higher economic output, which would make up at least some of the lost revenues. They maintain that dynamic scoring will, therefore, be both more neutral and more accurate than current methodologies. He then gives two reasons why he doesn’t like dynamic scoring. First, he argues that a modernized system will be imprecise. Economists disagree on the answers, and different models’ predicted feedback effects vary wildly, depending on the values selected for those uncertain assumptions. …Consider the nonpartisan scorekeepers’ estimates of the consequences of a tax-reform bill proposed last year by Representative Dave Camp, Republican of Michigan. Using different models and plausible inputs, the scorekeepers estimated that, under the bill, total gross domestic product might rise between 0.1 percent and 1.6 percent over the next decade — a 16-fold spread in projected outcomes. Which result should be the basis of congressional scorekeeping? He’s certainly right that economic models will generate a range of predictions. And I’ll be the first to admit that models are woefully inadequate in their attempts to measure millions of people making billions of decisions. Heck, I’ve even pointed out that economists are terrible forecasters. But Kleinbard is basically arguing that it’s better to be exactly wrong than inexactly right. That’s very precise, but it’s also very wrong. In reality, a doubling of tax rates would have a very large and very negative impact on economic performance. Shouldn’t lawmakers have a system that at least gives them an estimate, or a range of estimates, to suggest the possible real-world consequences? This video explains what is wrong with the Joint Committee on Taxation’s methodology. Kleinbard’s second argument against dynamic scoring is based on his assumption that bigger government is good for the economy since the government spends money wisely. Federal deficits are on an unsustainable path (as it happens, because of undertaxation, not excessive spending). Simply cutting taxes against the headwind of structural deficits leads to lower growth, as government borrowing soaks up an ever-increasing share of savings. …these models are political statements. They show the biggest economic effects by assuming that tax cuts are financed by unspecified future spending cuts. The smaller size of government, not the tax cuts by themselves, largely drives the models’ results. …the models are not a step toward more neutral revenue estimates, because they assume that, while individuals make productive investments, government does not. In reality, government spending contributes significantly to economic output. …When revenues do in fact decline and deficits rise, those same proponents will push for steep cuts in government insurance or investment programs, because they will claim that the models demand it. Wow. I hardly know where to start. So many wrong assertions in so little space. I guess I’ll begin by pointing out that it’s absurd to argue America’s fiscal problems are the result of taxes being too low. But if you don’t believe me, just look at the White House’s own numbers. But the most important point to address is that Kleinbard thinks government spending is more efficient than private spending. That arguably might be true if government was consuming only 2 percent of GDP and certain core “public goods” weren’t being provided. But that’s hardly the case today, or at any time in recent history. The burden of government spending is well beyond the growth-maximizing level in the United States. This video elaborates. The evidence strongly indicates we need less government rather than more. Unless, of course, you think the United States would grow faster if we were more like France or Greece. 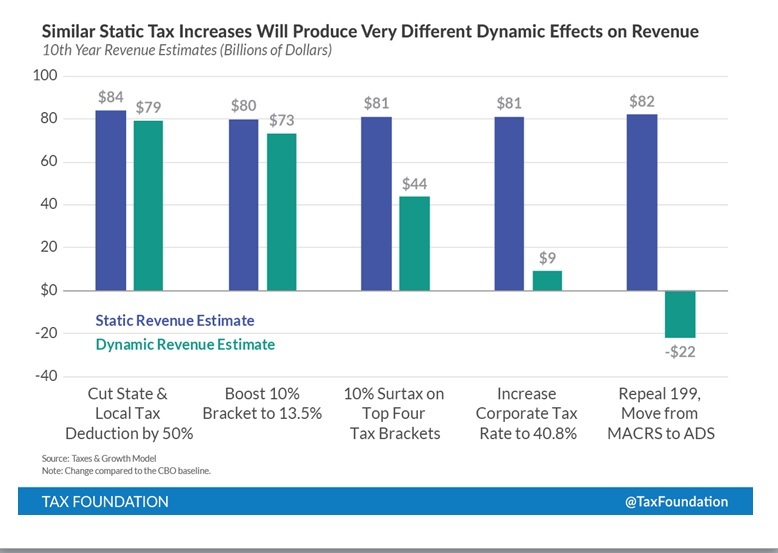 * There are some “micro-economic” feedback effects in the current system, so even the JCT wouldn’t assert that revenues would double if tax rates rose by 100 percent. P.S. Here’s my debunking of the straw-man debunking of the Laffer Curve and dynamic scoring. Many statists are worried that Republicans may install new leadership at the Joint Committee on Taxation (JCT) and Congressional Budget Office (CBO). This is a big issue because these two score-keeping bureaucracies on Capitol Hill tilt to the left and have a lot of power over fiscal policy. The JCT produces revenue estimates for tax bills, yet all their numbers are based on the naive assumption that tax policy generally has no impact on overall economic performance. Meanwhile, CBO produces both estimates for spending bills and also fiscal commentary and analysis, much of it based on the Keynesian assumption that government spending boosts economic growth. I personally have doubts whether GOPers are smart enough to make wise personnel choices, but I hope I’m wrong. Matt Yglesias of Vox also seems pessimistic, but for the opposite reason. He has a column criticizing Republicans for wanting to push their policies by using “magic math” and he specifically seeks to debunk the notion – sometimes referred to as dynamic scoring or the Laffer Curve – that changes in tax policy may lead to changes in economic performance that affect economic performance. He asks nine questions and then provides his version of the right answers. Let’s analyze those answers and see which of his points have merit and which ones fall flat. But even before we get to his first question, I can’t resist pointing out that he calls dynamic scoring “an accounting gimmick from the 1970s” in his introduction. That is somewhat odd since the JCT and CBO were both completely controlled by Democrats at the time and there was zero effort to do anything other than static scoring. I suppose Yglesias actually means that dynamic scoring first became an issue in the 1970s as Ronald Reagan (along with Jack Kemp and a few other lawmakers) began to argue that lower marginal tax rates would generate some revenue feedback because of improved incentives to work, save, and invest. Now let’s look at his nine questions and see if we can debunk his debunking. He’s sort of right. 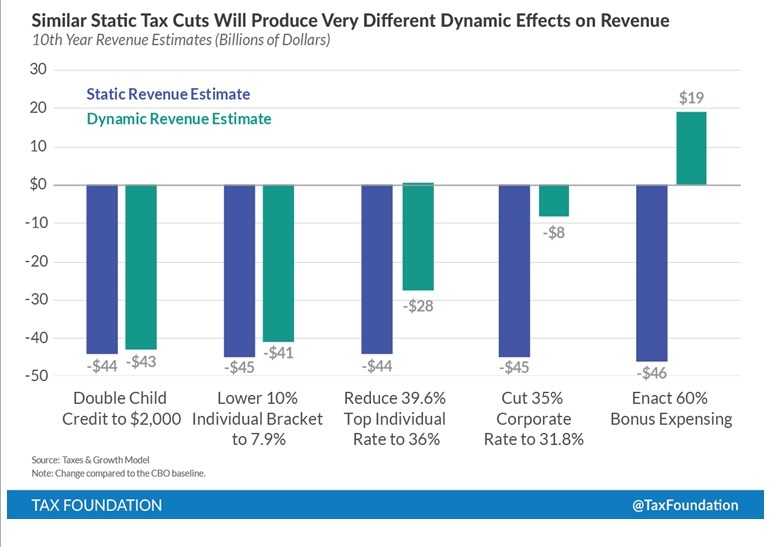 There are definitely examples of conservatives overstating the pro-growth impact of tax cuts, particularly when dealing with proposals – such as expanded child tax credits – that presumably will have no impact on economic performance since there is no change in marginal tax rates on productive behavior. But notice that he doesn’t address the bigger issue, which is whether the current approach (static scoring) is accurate and appropriate even when dealing with major changes in marginal tax rates on work, saving, and investment. That’s what so-called supply-side economists care about, yet Yglesias instead prefers to knock down a straw man. 2. The second question is “What is the Laffer Curve?” and Yglesias answer his own question by asserting that the “basic idea of the curve is that sometimes lower tax rates lead to more tax revenue by boosting economic growth.” He then goes on to ridicule the notion that tax cuts are self-financing, even citing a column by National Review’s Kevin Williamson. Once again, Yglesias is sort of right. Some Republicans have made silly claims, but he mischaracterizes what Williamson wrote. More specifically, he’s wrong in asserting that the Laffer Curve is all about whether tax cuts produce more revenue. Instead, the notion of the curve is simply that you can’t calculate the revenue impact of changes in tax rates without also measuring the likely change in taxable income. The actual revenue impact of changes in tax rates will then depend on whether you’re on the upward-sloping part of the curve or downward-sloping part of the curve. 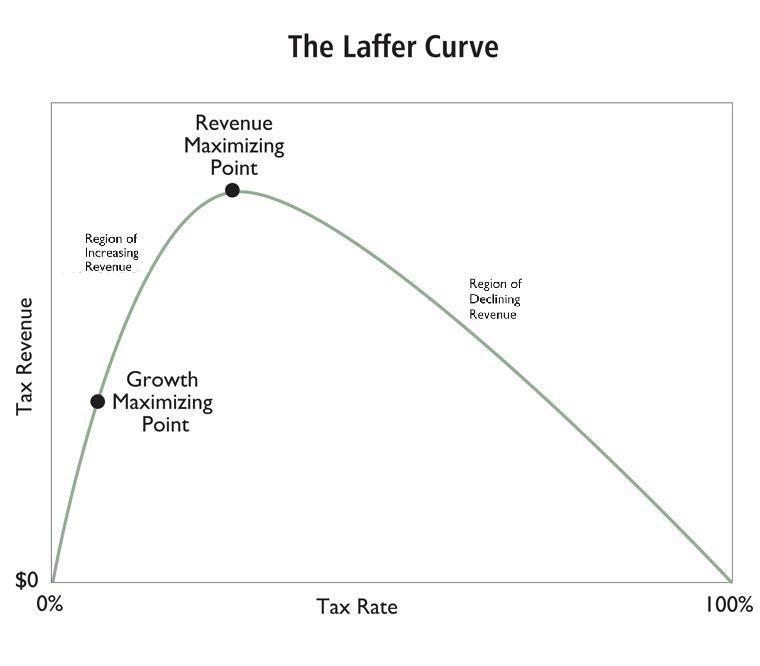 The real debate is the shape of the curve, not whether a Laffer Curve exists. Indeed, I’m not aware of a single economist, no matter how far to the left (including John Maynard Keynes), who thinks a 100 percent tax rate maximizes revenue. Yet that’s the answer from the JCT. Moreover, the Laffer Curve also shows that tax increases can impose very high economic costs even if they do raise revenue, so the value of using such analysis is not driven by whether revenues go up or down. But that leaves open the question as to whether the economy does better because of the lower tax burden, the lower spending burden, or some combination of the two effects. But I’ll take any of those three answers. The bottom line is that there’s no consensus on the economic impact of taxation (in part because it is difficult to disentangle the impact of taxes from the impact on spending, and that’s not even including all the other policies that determine economic performance). But I still think Yglesias is being a bit misleading because there is far more consensus on the economic impact of marginal tax rates and debates about the Laffer Curve and dynamic scoring very often revolve around those types of tax policies. He’s right, but CBO uses so-called demand-side effects to justify Keynesian spending, so that’s not exactly reassuring news for people who focus more on real-world evidence. And he’s also right that JCT measures changes in behavior (such as smokers buying fewer cigarettes if the tax goes up), and this type of analysis (sometimes called microeconomic dynamic scoring) certainly is a good thing. But the real controversy is about macroeconomic dynamic scoring, which we’ll address below. 5. The fifth question is “Can we take a break from all this macroeconomic modeling?” and is simply an excuse for Yglesias to make a joke, though I can’t tell whether he is accusing Reagan supporters of being racists or mocking some leftists for accusing Reagan supporters of being racist. So I’m not sure how to react, other than to recommend the fourth video at this link if you want some real Reagan humor. But this is why I think my view is the reasonable middle ground. At one extreme you find (at least in theory) some over-enthusiastic Republican types who argue that all tax cuts are self-financing. At the other extreme you find the JCT saying tax policy has no impact on the economy and actually arguing that you maximize tax revenue with 100 percent tax rates. I suspect that Yglesias, if pressed, will agree the JCT approach is nonsensical. So why not have the JCT – in a fully transparent manner – begin to incorporate macroeconomic analysis? In other words, dynamic analysis was not used to imply that tax cuts are self-financing. Indeed, the dynamic score in the example of what would happen if the Bush tax cuts were made permanent turned out to be very modest. So why, then, are folks on the left so determined to block reforms that – in practice – don’t yield dramatic changes in numbers? My own guess, for what it’s worth, is that they don’t want any admission or acknowledgement that lower tax rates are better for growth than higher tax rates. He’s not just sort of right. He’s completely right. I have no disagreements. 9. The ninth question is “Why does the score matter?” and his self-response is “the scores matter because perceptions matter in politics.” In other words, politicians don’t want to be accused of enacting legislation that is predicted to increase red ink. At the risk of being boring, I also think he’s right about the degree to which scores matter. The bottom line is that questions #1, #2, #3, and #6 are the ones that matter. Yglesias makes plenty of reasonable points, but I think his argument ultimately falls flat because he spends too much time attacking the all-tax-cuts-pay-for-themselves straw man and not enough time addressing whether it is reasonable for the JCT to use a methodology that assumes taxes have no effect on the overall economy. But I expect to hear similar arguments, expressed in a more strident fashion, if Republicans take prudent steps – starting with personnel changes – to modernize the JCT and CBO apparatus. P.S. While tax cuts usually do lead to revenue losses, there is at least one very prominent case of lower tax rates leading to more revenue. P.P.S. If the JCT approach is reasonable, why do the overwhelming majority of CPAs disagree? Is it possible that they have more real-world understanding of how taxpayers (particularly upper-income taxpayers) respond when tax rates change? P.P.P.S. If the JCT approach is reasonable, why do international bureaucracies so often produce analysis showing a Laffer Curve? There’s also some nice evidence from Denmark, Canada, France, and the United Kingdom. The Congressional Budget Office (CBO) and Joint Committee on Taxation (JCT) are congressional bureaucracies that wield tremendous power on Capitol Hill because of their role as fiscal scorekeepers and referees. Unfortunately, these bureaucracies lean to the left. When CBO does economic analysis or budgetary estimates, for instance, the bureaucrats routinely make it easier for politicians to expand the burden of government spending. The accompanying cartoon puts it more bluntly. And when JCT does revenue estimates, the bureaucrats grease the skids for anti-growth tax policy by overstating revenue losses from lower tax rates and overstating revenue gains from higher tax rates. Here are some examples of CBO’s biased output. The CBO – over and over again – produced reports based on Keynesian methodology to claim that Obama’s so-called stimulus was creating millions of jobs even as the unemployment rate was climbing. CBO has produced analysis asserting that higher taxes are good for the economy, even to the point of implying that growth is maximized when tax rates are 100 percent. Continuing a long tradition of under-estimating the cost of entitlement programs, CBO facilitated the enactment of Obamacare with highly dubious projections. CBO also radically underestimated the job losses that would be caused by Obamacare. When purporting to measure loopholes in the tax code, the CBO chose to use a left-wing benchmark that assumes there should be double taxation of income that is saved and invested. On rare occasions when CBO has supportive analysis of tax cuts, the bureaucrats rely on bad methodology. But let’s not forget that the JCT produces equally dodgy analysis. The JCT was wildly wrong in its estimates of what would happen to tax revenue after the 2003 tax rate reductions. Because of the failure to properly measure the impact of tax policy on behavior, the JCT significantly overestimated the revenues from the Obamacare tax on tanning salons. The JCT has estimated that the rich would pay more revenue with a 100 percent tax rate even though there would be no incentive to earn and report taxable income if the government confiscated every penny. This means the JCT is more left wing than the very statist economists who think the revenue-maximizing tax rate is about 70 percent. Unsurprisingly, the JCT also uses a flawed statist benchmark when producing estimates of so-called tax expenditures. Though I want to be fair. Sometimes CBO and JCT produce garbage because they are instructed to put their thumbs on the scale by their political masters. The fraudulent process of redefining spending increases as spending cuts, for instance, is apparently driven by legislative mandates. But the bottom line is that these bureaucracies, as currently structured and operated, aid and abet big government. Regarding the CBO, Veronique de Rugy of Mercatus hit the nail on the head. The CBO’s consistently flawed scoring of the cost of bills is used by Congress to justify legislation that rarely performs as promised and drags down the economy. …CBO relies heavily on Keynesian economic models, like the ones it used during the stimulus debate. Forecasters at the agency predicted the stimulus package would create more than 3 million jobs. …What looks good in the spirit world of the computer model may be very bad in the material realm of real life because people react to changes in policies in ways unaccounted for in these models. And the Wall Street Journal opines wisely about the real role of the JCT. Joint Tax typically overestimates the revenue gains from raising tax rates, while overestimating the revenue losses from tax rate cuts. This leads to a policy bias in favor of higher tax rates, which is precisely what liberal Democrats wanted when they created the Joint Tax Committee. Amen. For all intents and purposes, the system is designed to help statists win policy battles. 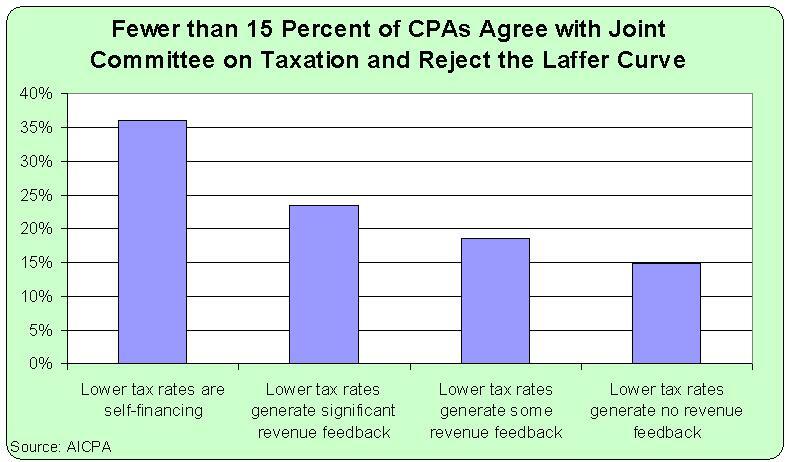 No wonder only 15 percent of CPAs agree with JCT’s biased approach to revenue estimates. So what’s the best way to deal with this mess? Some Republicans on the Hill have nudged these bureaucracies to make their models more realistic. That’s a helpful start, but I think the only effective long-run option is to replace the top staff with people who have a more accurate understanding of fiscal policy. Which is exactly what I said to Peter Roff, a columnist for U.S. News and World Report. Heck, it’s not just “very important” to put in a good person at CBO (and JCT). As I’ve written before, it’s a test of whether the GOP has both the brains and resolve to fix a system that’s been rigged against them for decades. So what will happen? I’m not sure, but Roll Call has a report on the behind-the-scenes discussions on Capitol Hill. Flush from their capture of the Senate, Republicans in both chambers are reviewing more than a dozen potential candidates to succeed Douglas W. Elmendorf as director of the Congressional Budget Office after his term expires Jan. 3. …The appointment is being closely watched, with a number of Republicans pushing for CBO to change its budget scoring rules to use dynamic scoring, which would try to account for the projected impact of tax cuts and budget changes on the economy. So who will it be? The Wall Street Journal weighs in, pointing out that CBO has been a tool for the expansion of government. …the budget rules are rigged to expand government and hide the true cost of entitlements. CBO scores aren’t unambiguous facts but are guesses about the future, biased by the Keynesian assumptions and models its political masters in Congress instruct it to use. Republicans who now run Congress can help taxpayers by appointing a new CBO director, as is their right as the majority. …The Tax Foundation’s Steve Entin would be an inspired pick. I disagree with one part of the above excerpt. Steve Entin is superb, but he would be an inspired pick for the Joint Committee on Taxation, not the CBO. But I fully agree with the WSJ’s characterization of the budget rules being used to grease the skids for bigger government. In a column for National Review, Dustin Siggins writes that Bill Beach, my old colleague from my days at the Heritage Foundation, would be a good choice for CBO. …few Americans may realize that the budget process is at least as twisted as the budget itself. While one man can’t fix it all, Republicans who want to be taken seriously about budget reform should approve Bill Beach to head the Congressional Budget Office (CBO). Putting the right person in charge as Congress’s official “scorekeeper” would be an important first step in proving that the party is serious about honest, transparent, and efficient government. …CBO has several major structural problems that a new CBO director should fix. Hmm… Entin at JCT and Beach at CBO. That might even bring a smile to my dour face. But it doesn’t have to be those two specific people. There are lots of well-regarded policy scholars who could take on the jobs of reforming and modernizing the work of JCT and CBO. But that will only happen if Republicans are willing to show some fortitude. And that means they need to be ready to deal with screeching from leftists who want to maintain their control of these institutions. For example, Peter Orszag, a former CBO Director who then became Budget Director for Obama (an easy transition), wrote for Bloomberg that he’s worried GOPers won’t pick someone with his statist views. The Congressional Budget Office should be able to celebrate its 40th anniversary this coming February with pride. …The occasion will be ruined, however, if the new Republican Congress breaks its long tradition of naming an objective economist/policy analyst as CBO director, when the position becomes vacant next year, and instead appoints a party hack. By the way, it shows a remarkable lack of self-awareness for someone like Orszag to complain about the possibility of a “party hack” heading up CBO. In any event, that’s just the tip of the iceberg. I fully expect we’ll also see editorials very soon from the New York Times, Washington Post, and other statist outlets about the need to preserve the “independence” of CBO and JCT. Just keep in mind that their real goal is to maintain their side’s control over the process. P.S. There’s another Capitol Hill bureaucracy, the Congressional Research Service, that also generates leftist fiscal policy analysis. Fortunately, the CRS doesn’t have any scorekeeper or referee role, so it doesn’t cause nearly as much trouble. Nonetheless, any bureaucracy that produces “research” about higher taxes being good for the economy needs to be abolished or completely revamped. P.P.S. This video explains the Joint Committee on Taxation’s revenue-estimating methodology. Pay extra attention to the section beginning around the halfway point, which deals with a request my former boss made to the JCT. P.P.P.S. If you want to see some dramatic evidence that lower tax rates don’t necessarily lead to less revenue, check out this amazing data from the 1980s. The fiscal cliff was a smaller loss than I expected. The sequester was a real victory. We have good evidence that the Tea Party has made a positive difference. The Democratic-controlled Senate rejected a permanent expansion of funds for the IMF. The burden of government fiscal policy has been reduced since the 2010 elections. Well, the drugs, love, and money must still be in my system because I’m going to share some more good news. Our lords and masters in Washington have taken a small step in the direction of recognizing the Laffer Curve. Here are some details from a Politico report. Here’s one Republican victory that went virtually unnoticed in the slew of budget votes last week: The Senate told the Congressional Budget Office it should give more credit to the economic power of tax cuts. It won’t have the force of law, but it was a big symbolic win for conservatives — because it gave them badly needed moral support in an ongoing war to get Washington’s establishment number crunchers to take their economic ideas more seriously. The amendment endorsed a model called “dynamic scoring,” which assumes that tax cuts will pay for at least part of their cost by generating more economic activity. The measure by Sen. Rob Portman (R-Ohio) called on CBO and the Joint Committee on Taxation to include “macroeconomic feedback scoring” in all future estimates of tax legislation. …Portman eked out a narrow 51-48 victory in the final series of budget votes that started around 3 a.m. on Saturday. Just in case you missed it, this modest victory for common sense took place in the Senate. You know, the place controlled by Harry Reid of Cowboy Poetry fame. To be sure, it’s not quite time to pop open the champagne. The vote was a symbolic victory for the think tanks and lawmakers on the right who have been fighting for years to force CBO and JCT to officially endorse the idea that people spend more and invest more when they owe the government less. …Conservatives’ ideas, including revenue-generating tax cuts and a more market-oriented health care system, can only work if tax policy changes people’s behavior — and that’s just not how CBO views the world. I’ve been very critical of both CBO and JCT, so I’m one of the people in “think tanks” the article is talking about. P.S. 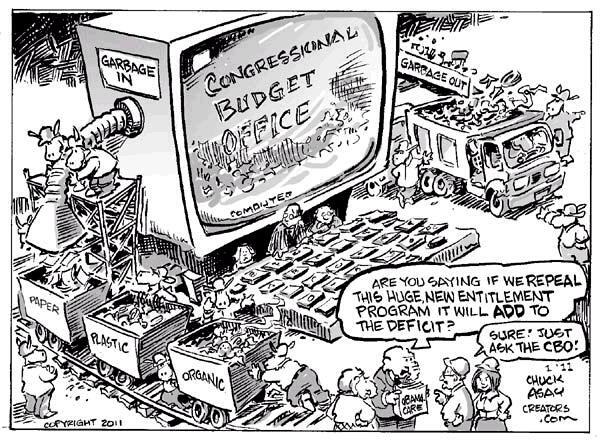 Chuck Asay has a good cartoon mocking the CBO. P.P.S. I’ll repeat, for the umpteenth time, that we want to recognize the insights of the Laffer Curve in order to facilitate lower tax rates, not because we want to maximize revenue for the government. P.P.P.S. Dynamic scoring is a double-edged sword. If the statists control everything, they’ll use the process to justify more spending using discredited Keynesian economics. I’m a big believer in the Laffer Curve, which is the common-sense proposition that changes in tax rates don’t automatically mean proportional changes in tax revenue. This is because you also have to think about what happens to taxable income, which can move up or down in response to changes in tax policy. The key thing to understand is that incentives matter. If you raise tax rates and therefore increase the cost the engaging in productive behavior, people will be less likely to work, save, invest, and be entrepreneurial. And they’ll figure out ways to engage in tax avoidance and tax evasion to protect the interests of their families. In other words, taxable income will be lower because of higher tax rates. Likewise, people will be more willing to earn – and report – taxable income if tax rates are reduced. If you don’t believe me, look at this incredible data showing how the rich paid for more money after Reagan slashed their tax rates. For some types of tax changes, such as lowering tax rates on the “rich,” the revenue feedback may be very large because they have considerable control over the timing, level, and composition of their income. In other cases, such as providing a child tax credit, the feedback may be very small because there’s not much of an impact on incentives to engage in productive behavior. This doesn’t necessarily mean one type of tax cut is good and the other bad. It just means that some changes in tax policy produce revenue feedback and others don’t. Even leftists recognize there is a Laffer Curve. They may argue that the “revenue-maximizing rate” is very high, with some claiming the government can impose tax rates of more than 70 percent and still collect additional revenue. But they all recognize that there’s a point where revenue-feedback effects are so strong that higher rates will lose revenue. Actually, let me rephrase that assertion. There is a small group of people in the nation who claim that there’s no Laffer Curve. But that’s no surprise, the world is filled with weird people. Some genuinely think the world is flat. Some think the moon landings were faked. You can probably find some people who actually think the sun is a giant candle in the sky. But what is surprising is that this small cadre of anti-Laffer Curve fanatics are at the Joint Committee on Taxation, which is the group on Capitol Hill in charge of providing revenue estimates on tax legislation. They aren’t completely oblivious to the real world. They do acknowledge some “micro” effects of changes in tax rates, such as people shifting between taxable and non-taxable forms of compensation. But they completely reject “macro” changes such as changes in economic growth and employment. So if we replaced the nightmarish income tax with a simple and fair flat tax, the JCT would assume no impact of GDP or jobs. If we went the other direction and doubled all tax rates, the JCT would blithely assume no change to the economy. To give you an idea of why this is an extreme view, I want to share some polling data. Last week, I spoke at the national conference of the American Institute of Certified Public Accountants. As you can imagine, this is a crowd that is very familiar with the internal revenue code. They know the nooks and crannies of the tax code and they have a good sense of how clients respond when tax policy changes. Prior to my remarks, the audience was polled on certain tax issues. They had four possible responses. Here’s the breakdown of their answers. These are remarkable results. A plurality (more than 36 percent) think the Laffer Curve is so strong that lower tax rates are self-financing. Even I don’t think that’s the case. Another 23.5 percent of respondents think there are very significant feedback effects, meaning that lower tax rates don’t lose much money. There were also 18.6 percent who thought there were some Laffer Curve effects, though they thought the revenue feedback wasn’t very significant. Less than 15 percent of the crowd, however, agreed with the Joint Committee on Taxation and said that lower tax rates have no measurable revenue feedback. Why am I sharing this information? Well, we’re going to have a big debate in the next month or two about President Obama’s proposed class-warfare tax hike on investors, entrepreneurs, small business owners, and other rich people. Supporters of that approach will cite Joint Committee on Taxation numbers to claim that the tax hike will generate a big pile of money. That number will be based on nonsensical and biased methodology. In an ideal world, opponents will mock that number and expose the JCT’s primitive approach. For additional information, here’s Part III of my video series on the Laffer Curve, exposing the role of the Joint Committee on Taxation. If you want to see Parts I and II, click here.